Most coaching clients don't hire coaches explicitly because they want to be happy. They generally hire a coach because they want something specific such as to make more money, be more productive, become better leaders, cope better with problems, be healthier, or even have stronger marriages. Why do they want these things? On some level they believe these things will make them happier, but that's not the real reason that positive psychology coaching, also known as Happiness Coaching, is important. It turns out happiness CAUSES all of the above, not necessarily the other way around, which is one of the many surprises that positive psychology researchers have uncovered. Happiness isn't just corrolated with success, it actually causes it. So if you're coaching on success in any realm, you'll probably be a lot more effective if you coach on happiness, first. And what makes people happy is often not what you think. All coaching needs to be positive psychology coaching. Watch this 2:34 video of leading positive pychology researcher, Sonia Lyubomirsky, on why happiness matters. The first meeting of the IAC North American Virtual Chapter offered amazing insights to members into IAC Coach Certification and what it takes to pass it. Our guests, Natalie Tucker Miller, IAC-CC, (Lead Certifier for and Past President of the IAC) and Elizabeth Nofziger, IAC-CC, (Certifying Examiner for the IAC)* went through the 9 IAC Coaching Masteries(tm) one by one and pointed out common mistakes and simple solutions to each one. The resulting audio recording is a 'must listen' for anyone who is thinking about qualifying for this highly respected coach certification. 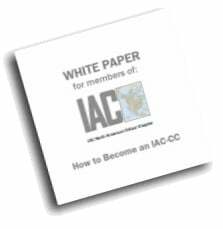 To welcome our 100 new members, I wrote a free white paper called, 'How to Become an IAC-CC'. I based the content of the white paper on observations of how the coaching industry and the role that coach certification plays in it, has changed over the years and I included lists of tips and 'do's and don'ts' that I've compiled in my years of teaching and mentoring coaches to become IAC Certified Coaches. It's not too late to join the IAC North American Virtual Chapter. Everyone who joins will get links to both the free White Paper and the audio recording of our first meeting. 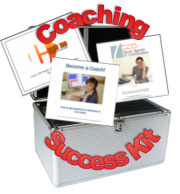 As an additional gift from School of Coaching Mastery, for a limited time, members of the new chapter can also save on a new 8-hour coach training program with Natalie Tucker Miller, IAC-CC, Elizabeth Nofiziger, IAC-CC, and me, called 'Certified Coach: Master What the Certifiers Are Looking For'. Join the chapter below to receive the white paper on how to become an IAC-CC, the audio recording of the certifiers, and a coupon code to join the new certification program and save. Join the IAC North American Virtual Chapter here. 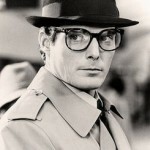 * Disclosure: Natalie and Elizabeth are also instructors and certifiers for School of Coaching Master. Coach Certification in a Weekend? If you're one of the many coaches who view coach certification as an critical goal in 2009, this will interest you. We were planning one of our advanced coach certification weekends this October, but coaches told us they want something else. I invite you to tell us what you want, too, in the survey called, 'Certification in a Weekend?' The survey closes this Thursday. So far, over 50 coaches have told us what they want and how much they want to pay for it. We have every single bit of it, too! We're offering a special preview recording of 'Master Coach Demos', a new product that we're producing, to everyone who participates in the survey. We'll also provide you with customized recommendations, so you get the certification support you need, not just a pre-packaged product that may not fit your unique requirements.